True, Americans don’t understand some fundamentally important details of Obamacare very well. But it’s not just Obamacare. They don’t understand lots of fundamentally important details of today’s health insurance products. Consider health savings accounts (HSAs). A recent survey for Fidelity Investments (PDF) found that a sample of American adults responsible for household health insurance decision-making knew very little about how they work. This is captured in the chart below; more at the link. In light of this, apart from, say, Medicare for all (which I am not hereby advocating), it’s hard to imagine a large majority of Americans fully grasping any health insurance regime. Maybe Obamacare is about as well understood as can be expected, especially in light of obstacles to implementation and outreach. 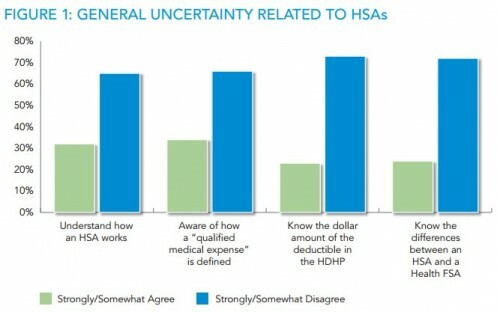 The HSA research study was conducted on behalf of Fidelity Investments by GfK Public Affairs & Corporate Communications from February 4-20, 2013, using GfK’s online KnowledgePanel. The study was conducted among a nationally representative sample of 1,836 U.S. adults between the ages of 25 to 62, with a household income of $25,000 or more, who have primary or shared responsibility for household financial decisions and receive healthcare benefits through their own or a spouse’s employer. Of the respondents, 306 self-identified as being enrolled in a high-deductible health insurance plan that allows an HSA, and another 306 self-identified as declining to enroll in the same.